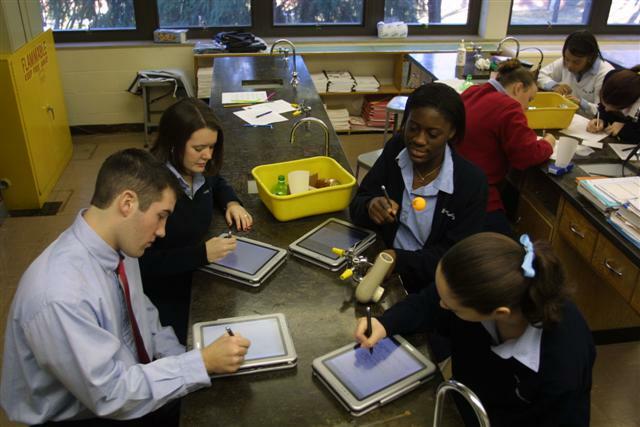 The Diocese of Columbus Department of Education is undertaking one of the first wide-scale deployments of Tablet PC technology in an educational environment. They have partnered with HP and their TC 1000 Tablet PC. I recently spend some time talking with Kenneth Collura, the technology coordinator of the Diocese. Tabletpctalk.com will be following the progress of the students and teachers throughout the life of this exciting project. 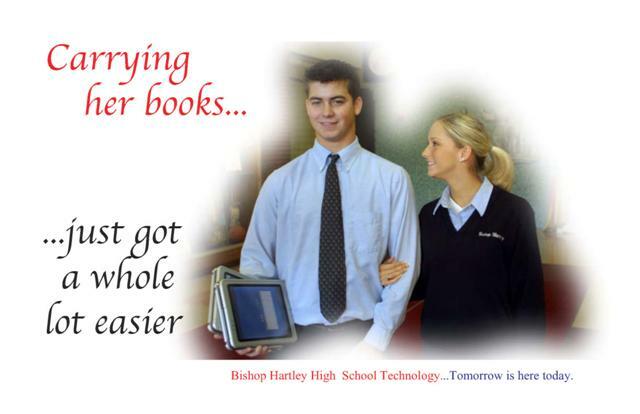 I (Kenneth Collura) am the technology coordinator for the schools of the Diocese of Columbus. We currently have 46 elementary and 11 high schools. I am always looking for better ways to educate and most of the time that translates into alternative ways of communicating. I have been following the "mobile concept" since Newton days, through eMate etc. When I saw Bill Gates at COMDEX in 2000, I thought that this would be the project to test out. What are your goals of the project? Our goal is to provide better and alternative ways of educating students. We recognize that students possess different learning styles that require a variety of ways of communicating content and concepts. We are constantly looking for tools that will not cause students to stand apart from others while learning. If we can provide students with the same basic instrument and allow them to best adapt it to their style of learning any stigma of difference is reduced or removed. What are your goals for the kids? Better organization, reduced paper consumption (don't laugh), facilitate studying. Alternative methods of input…keyboard, stylus and/or voice. The ability to move notes around, snip content from texts or Internet, to search notes and other handwritten documents is very exciting to the students. 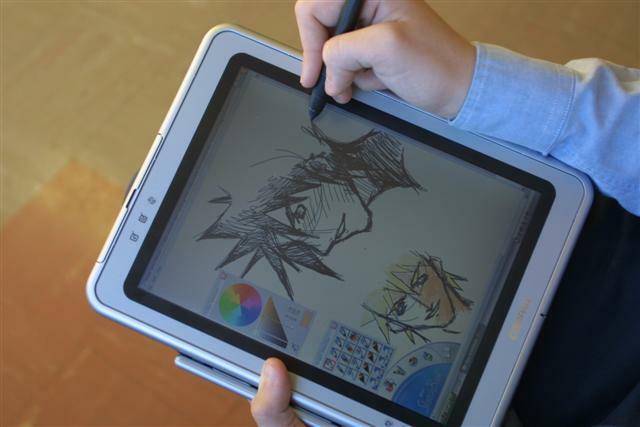 Why did you choose the Compaq Tablet PC? I like the design, tougher screen, stylus garage and memory upgradeability. The hybrid convertible is nice. Although I see most of the students using handwriting as a means of input, the presence of a keyboard gives a sense of familiarity to the student. In a panic they can always resort to the standard typed entry. What configuration did you purchase and what applications that will be used? Students will be provided a TC1000 with 30 gig hard drive, spare battery and a “pleather” carrying case with foam insert (for added protection). We are providing students with Office XP (we would like to beta Office 11) , Snipit, Graphcalc, Alias Sketchpad or Corel Grafigo, full version of Adobe Acrobat, goldwave, ereader, indirect, Pen Office, Antivirus solution. We have purchased the 3 year full replacement warranty for all units. Who is eligible for the Tablet PC initiative? All seniors are eligible. There is no pressure to participate and some students have opted out of the program for various reasons. Those who do participate need to have a form signed by a parent or guardian that informs them of the program and their responsibility for replacing the unit if it is lost. This can be covered by homeowners or renters insurance. Why did you choose this specific school as the test bed? This school is a “melting pot” in all of the classic terms. It is co-ed, covers all the socio-economic levels and is racially diverse. What have you been doing since then to prepare for this implementation? We prepared for the tablets by improving the buildings infrastructure and both teachers and students willingness to accept such a dramatic change. The school is set up for wireless networking. We recently did a wireless audit to make sure we had proper coverage. We ended up adding some more access points. We have also enabled wireless encryption. We are installing servers to provide backup storage in the event a unit is lost or sent in for repair. 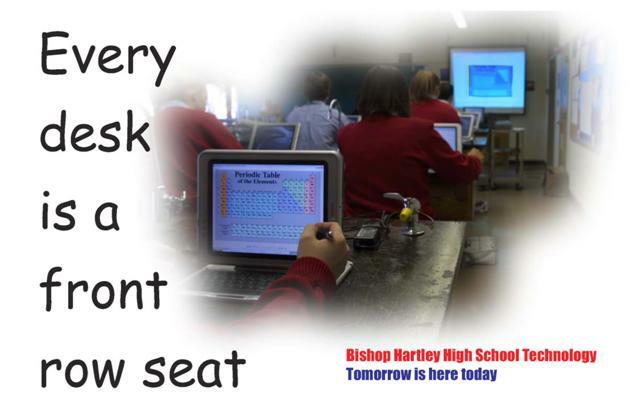 Teachers were moved from desktops to laptops to get them used to a mobile environment. Computer labs were supplemented with mobile laptop carts to show that each and every classroom can be a “computer lab”. Local printers were replaced with network printers. We also created an intranet for students and teachers. Teachers post all class assignment to the website. Students login then download them and do their assignments. When they are completed, the student uploads the documents back to the intranet and the assignment is routed to the teacher. We will begin with 6 senior teachers and I will train each prior to implementation. All are willing but experience is varied (as designed). Teachers will use the newly developed document sharing program to post assignments in any desired form (written, verbal [eg. foreign language], worksheets etc) and the students will access, complete and submit in the same way. Teachers will grade by annotating document and using audio comments and send back to student as email attachment. We are also creating homework assignment notebooks in MS Journal. How will you roll this out to the students? The first 15 units recently arrived and one-on-one student training started in January. These sessions are for one hour at a time. It is the plan to have the rest in so that the students will have them for 2nd semester (Jan 25th). We are working on some allocation issues with HP. Angela Smith from HP has been a great resource for us. 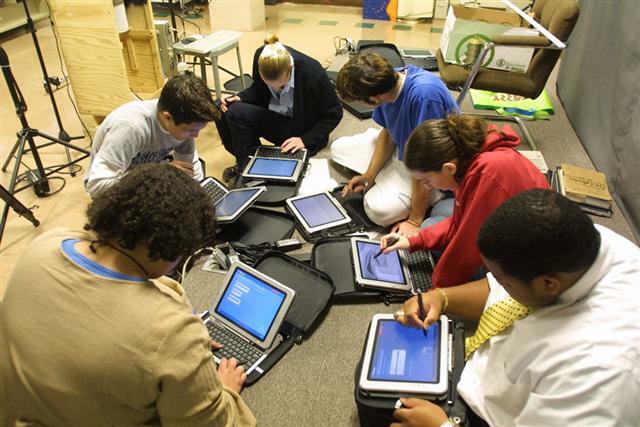 Getting mobile devices into the hands of students poses additional challenges. What are you doing there? We are training the students to store documents to our server. This will allow retrieval if the unit is lost. We are also teaching them best practices. What do you allow or block? We are doing CIPA (Children’s' Internet Protection Act) compliant filtering through our ISP. Other than that, students are free to use the machines as they see fit. Students can use IM without restriction. Isn’t free browsing or IM a distraction? Students have always found a way to not pay attention in class if that is their choice. They can find many ways to be distracted in the classroom. Teachers know the challenges of keeping their students involved in a lesson. We think that having the Tablet PC will actually engage the students in learning. What would you like to have that is not readily available now? I would have like to have had a Firewire port, however USB 2.0 is nice. 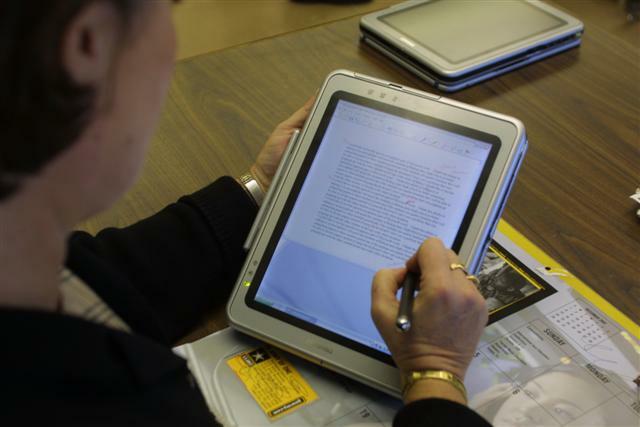 Getting all publishers to work at getting digital textbooks is a must. It is our goal to have all the texts loaded on their respective tablets to allow highlighting, annotation and snipping. Longer battery life and shorter recharging times are always welcome. Reduced glare screen would also be nice. An eraser on the pen would work well. What other technologies have you implemented? Two of the most recent programs have been creating Video on Demand units for professional development and the use of the Apple iPod in the foreign language classes. In the latter program students use their computer (desktop, laptop or tablet) to listen to and respond orally to an assignment. The assignment is submitted via the intranet and retrieved by the teacher. The teacher downloads the classes work on his/her iPod. They can digitally select students by name and using the “CD” controls they have much better access than with cassette tapes. They can even sort by student providing a “audio portfolio” that will demonstrate student progression over time. What are the next phases of the project? Next school year the seniors will have the tablets for the entire year. In 2004-2005 we will expand the program to include the Junior class. Other schools will be brought on as the results of the “pilot’ are evaluated (as soon as next year).